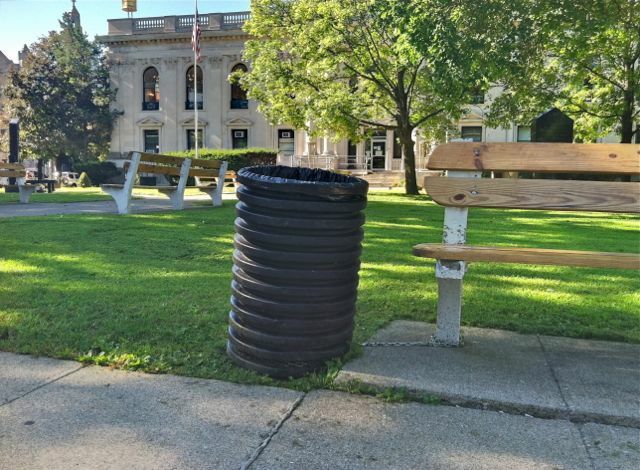 Recently I was sitting in the park in front of our county courthouse and was struck by the ugliness and cheapness of the trash containers, sections of corrugated black plastic drainage pipe. Take a look next time you happen by. What are they thinking about in the that building? Just this spring there was considerable, well-deserved hullabaloo about plans to restore the courthouse and preserve it facade. And, the park is home to numerous monuments to war dead. Curiously, this spring considerable time and effort was spent on sanding down and varnishing the wooden surfaces of all the park benches. Now these…. ?